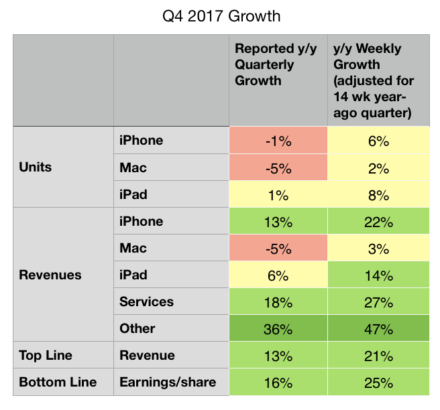 The first number that Tim Cook mentioned in the fourth quarter investor conference call was the number of active Apple devices. 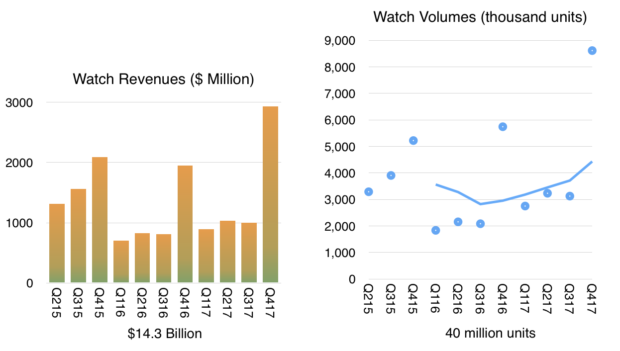 The 1.3 billion monthly active devices is the most important measure of the health of Apple’s business. It’s the primary way the company chooses to measure itself and it’s the best instrument available to understand the company’s strategy. This is only the second time this number was revealed. 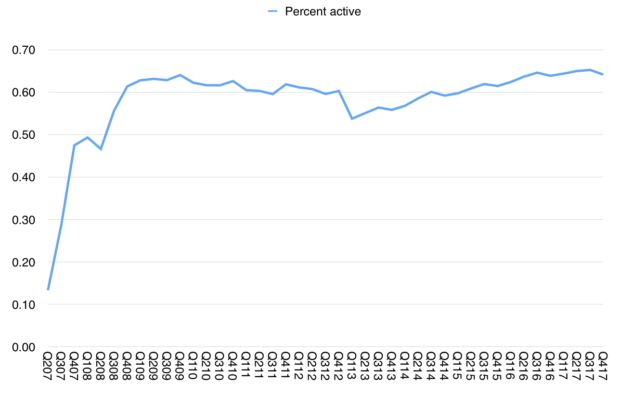 The previous figure, given in January 2016, was 1 billion active devices. 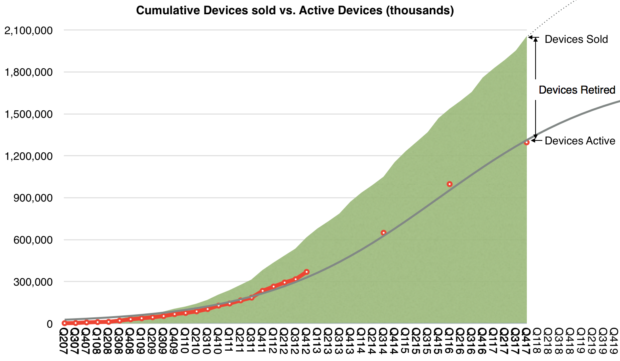 Thus, while Apple sold 586,744,000 devices1 the number of active devices increased by 300,000,000. While the number of units sold is frequently updated and attracts a lot of attention, the number of units active is very infrequently updated and attracts little attention. Yet the number of active devices speaks of the future of the company and should be carefully scrutinized while the number of devices sold speaks of the past and should be cursorily glanced at. Dr. Edward Deming once said that the numbers that best define a company are two factors that do not appear on any financial statement. These factors are the value of a satisfied customer and the value of a dissatisfied customer. These factors must be multiplied by every other number in a financial statement in order to assess the prospects of the business. A high satisfaction leads to repeat purchases and referrals, growing the business; while a low satisfaction leads to ending relationships and a repulsion of potential new customers. 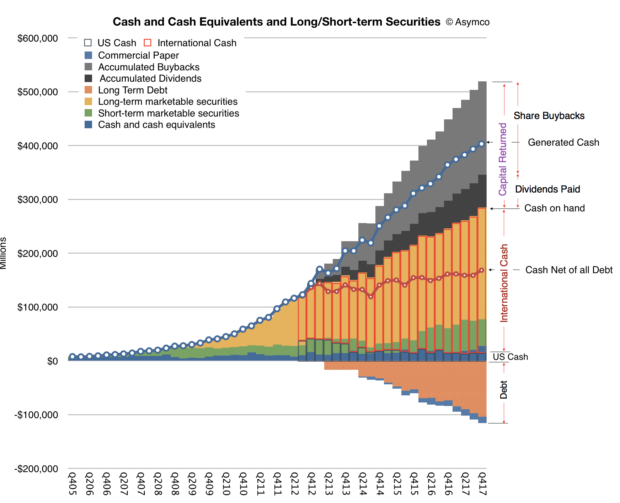 These numbers determine everything about the future and nobody quite knows what they are. It’s tempting to suppose that, by asking, you can find out if customers are satisfied. Certainly the company cites these answers to the question of satisfaction and it’s partially useful to have some data. But customers are people and people are social beings. They are flawed in that they want to be liked and will use their powers of deduction to determine whether what they say will lead to their being liked more. Thus they will say things which they judge the listener will want to hear. This auto-suggestion is especially likely when the answer (satisfaction) is so difficult to ascertain and the feeling is so fleeting. You can’t rely on surveys alone to know if people like your product. You have to base that number on what they do. This is where the active device data comes in. A liked product will be used and a well-liked product will be used more. Usage is valuable not just in its intensity but also in its duration. When you see activity of a device it’s always a good sign if that is both frequent and long-lasting. 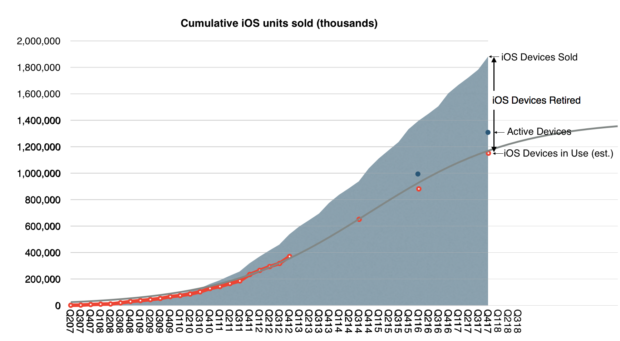 The following graph shows the history of cumulative devices sold by Apple since mid-2007, when the iPhone was launched. 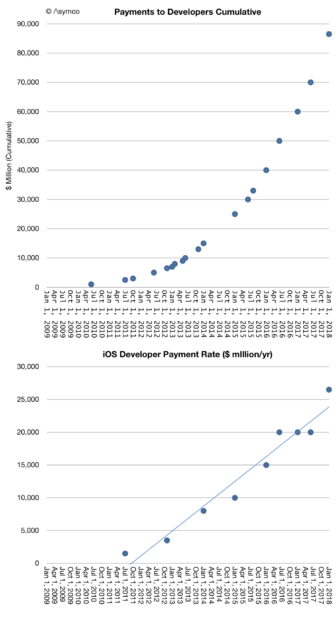 That total is now 2.05 billion devices. 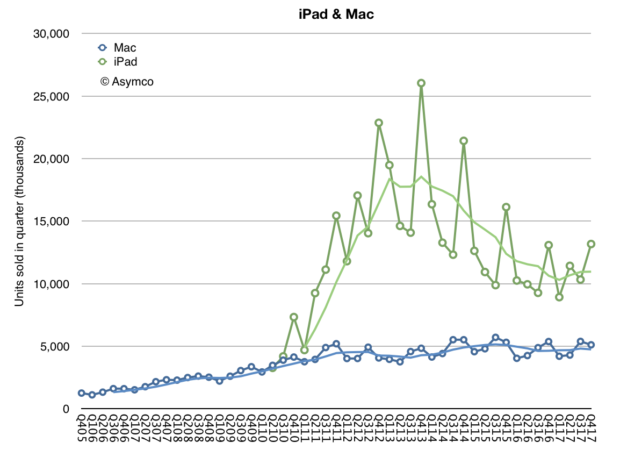 I have added early estimates on the number of active devices (in red) based on assumptions about product life-span. I added the company’s own reported figures since then. I then tried to paint a continuous curve for this active number using a logistic function which assumes a diffusion into a population of addressable users, shown as the grey line above. The logistic curve is a good tool because it has a solid theoretical foundation in social behaviors. The formula for this line is S÷(1+EXP(−1×(t−o)÷g)) where S is the point of saturation or maximum population size, t is the period or count of quarters (1 for Q1 2007 and 2 for Q2 2007, etc), o is the offset to 50% or the point of inflection, in quarters, and g is the growth factor. The S-curve above corresponds to S=1.8 billion, o=35 and g=8. I chose these parameters because they best fit the data. It does not mean the reality will be precisely this but this is the best guess so far. It implies that there will be about 1.8 billion active devices sometime close to 2022 and tells us how we get there. This can and will change but for now this is the best guess using a theory that has worked in similar circumstances. 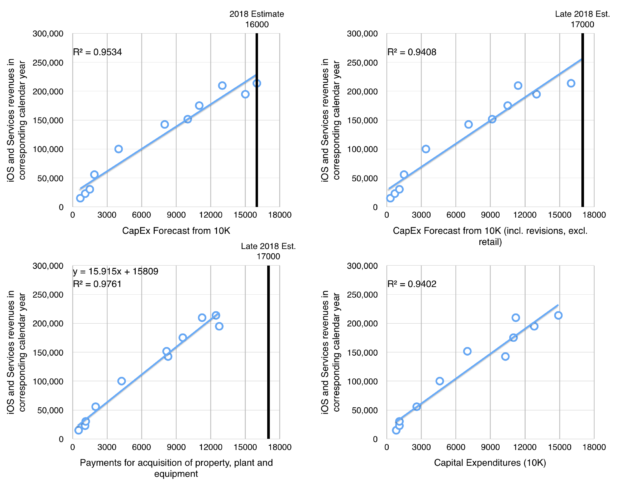 Working backwards from this active base estimate, we have predictive power on units sold, and even on revenues. However this is not the whole story. It’s not even the main story. What matters is what it tells us of the relationship between past behavior (purchases) and future behavior (use, referral, repeat purchase). This is hinted at by the ratio between purchases and active devices. In other words, the ratio between cumulative units and active units tells us whether the products are used and for how long. Having a continuous estimate of active uses allows for a reliable measure of satisfaction. The following graph shows this estimate. Note that the ratio remains remarkably constant. It’s currently about 64%. It’s so constant that perhaps we can invent a rule of thumb which says that two out of every three devices ever sold by Apple is still in use. And that this rule is always true. This begins to be interesting. The staying power and predictability of the business2 comes from a guarantee that activity is rigidly tied to purchase. This speaks more than any satisfaction survey. It’s a measure of actions based on interaction rather than words based on human frailty. 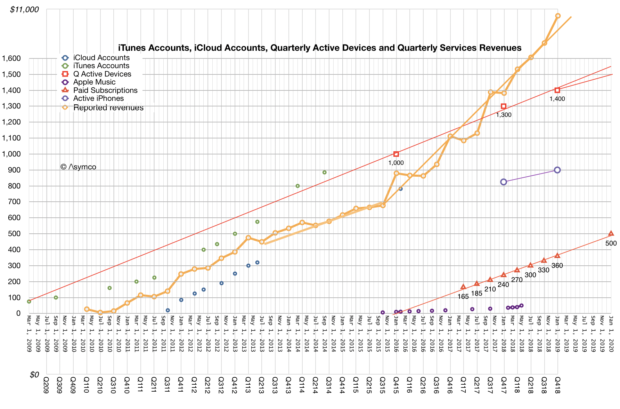 There is no better number available to predict Apple’s business. One of the more common statements out of Apple is that “Music is very important to us.” This is one of those easily dismissed Apple platitudes. Like caring about products or customer privacy or other such nonsense. But if you pay attention you notice music is always a consideration for the company. The obligatory music act at the end of Apple events, the multitude of speakers and audio accessories in an Apple Store, the headphones branded Apple and Beats, the music-heavy ads. It’s as if Apple’s brand had a musical score. And of course there is the history. Steve Jobs not only put music at the heart of the brand but he re-built Apple’s business around music starting in 2001. The Rip, Mix, Burn campaign, the iPod and iTunes which not only oriented the company away from Computers but also disrupted the “record industry,” unbundling the album and destroying peer-to-peer sharing at the same time. Apple was so powerfully oriented around music that I remember someone at Google in 2006 dismissing Apple as “that media company”. But it seems that music has faded in importance or at least in mindshare. Music is the least exciting media type in an age of increasingly pervasive visual stimuli. AR, VR is what we’re supposed to dream of and of course screens, screen are everywhere. I note that at least in the US TV screens are now placed in public spaces bombarding us with imagery instead of speakers pumping out muzak. Music has been relegated to offering personal space. We only use it through headphones to isolate us from the auditory pollution around us. Racks of audio components and enormous speakers are gone from our living rooms replaced with outrageously large screens. And so pundits are calling for Apple to “do something” about video. To buy Netflix or to chase after content and build or buy properties. Look, Disney just bought Fox and Amazon is making movies and so is, apparently, everyone else. 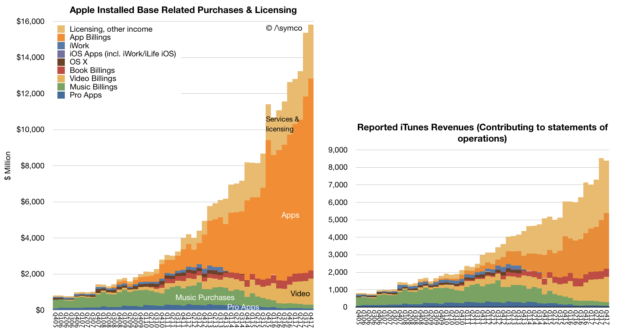 But instead Apple sill sells songs and has a radio station. And it has a streaming subscription with “only” 30 million subscribers. Even when it comes to original video content it rolls out a Karaoke show, of all things. It still maintains an app called GarageBand. It goes and buys Shazam, and paid $3 billion for Beats and still makes AirPods and is about to launch a speaker. Yes, a loudspeaker called HomePod. But all the cynicism around music is tone deaf to the sheer emotion that music can create. Music touches people like nothing else. I’ve seen young and old cry and burst with joy listening to music. For its low bandwidth, music delivers enormous emotional bandwidth. It always has and always will. It’s not obsolete and will never be. Music imprints itself in hearts and remains there for a lifetime. It’s poetry for the senses. 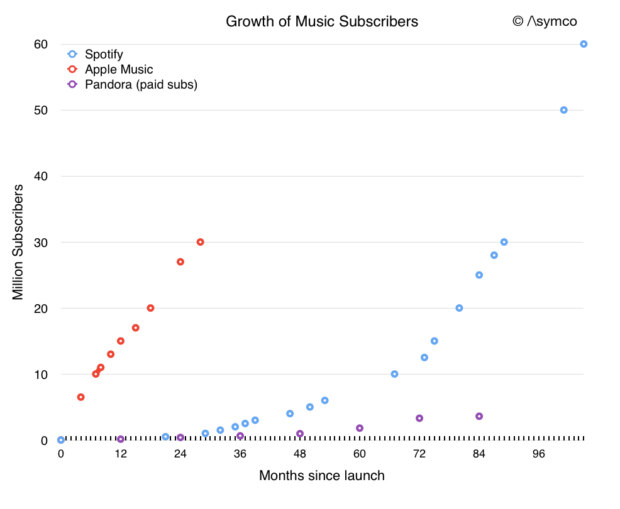 Business models for music will come and go but music consumption is increasing. Access to the long tail has meant genres proliferated and production has spread to everyone who cares to try to make music. And so it is that more people listen to music on their widescreen iPods in more places and more times than ever before. Apple realizes this and the acquisition of Shazam and the launch of AirPods and of HomePod are to serve music. Siri or intelligent assistance are nice new services but they are not in lieu of the need for music. Chatty robots are appealing to intellect. Music appeals to the soul. These new products are in service of music because music is what people hire far more than advice. HomePod will surprise not because it will be a better at chatting. It will surprise because it will cause you to sit down and listen in awe.